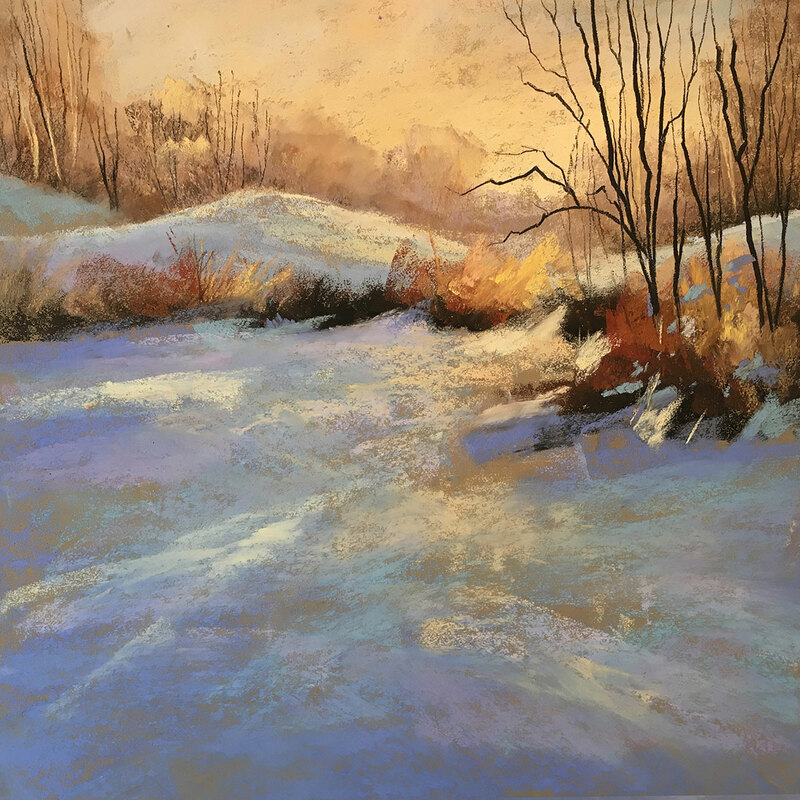 Soft pastels are a great medium for portraying light. 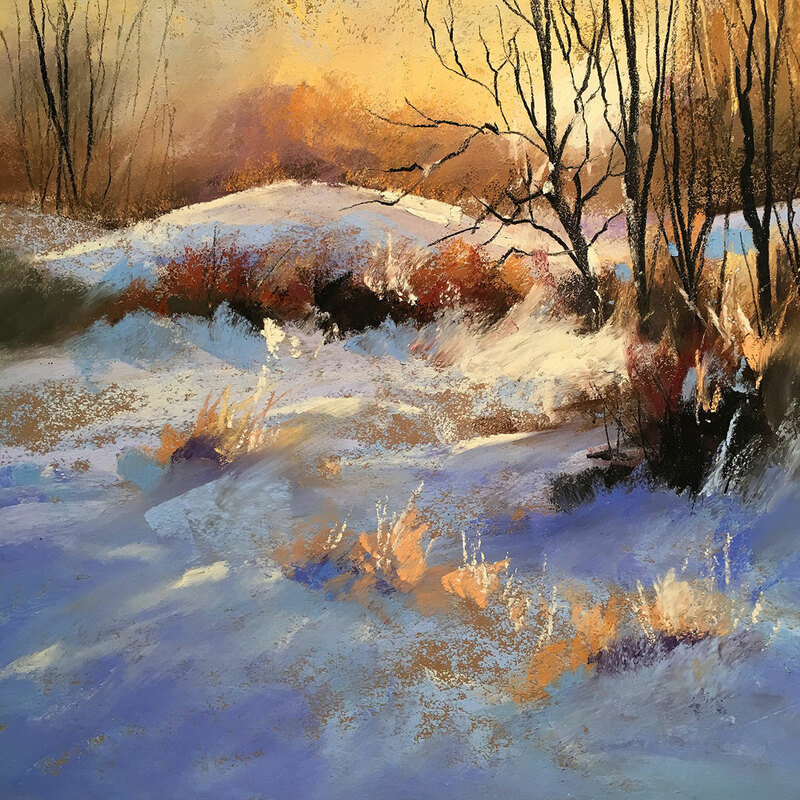 British artist Les Darlow is a master of landscapes in pastel. 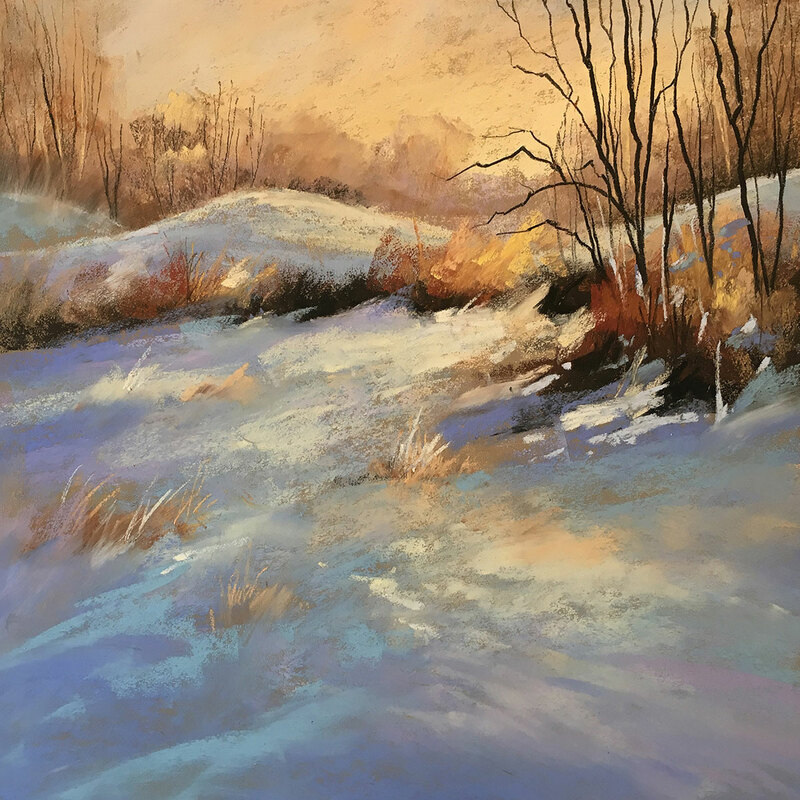 He takes us through his process of painting a landscape with lots of light using Schmincke Soft Pastels, the preferred pastel of many artists. 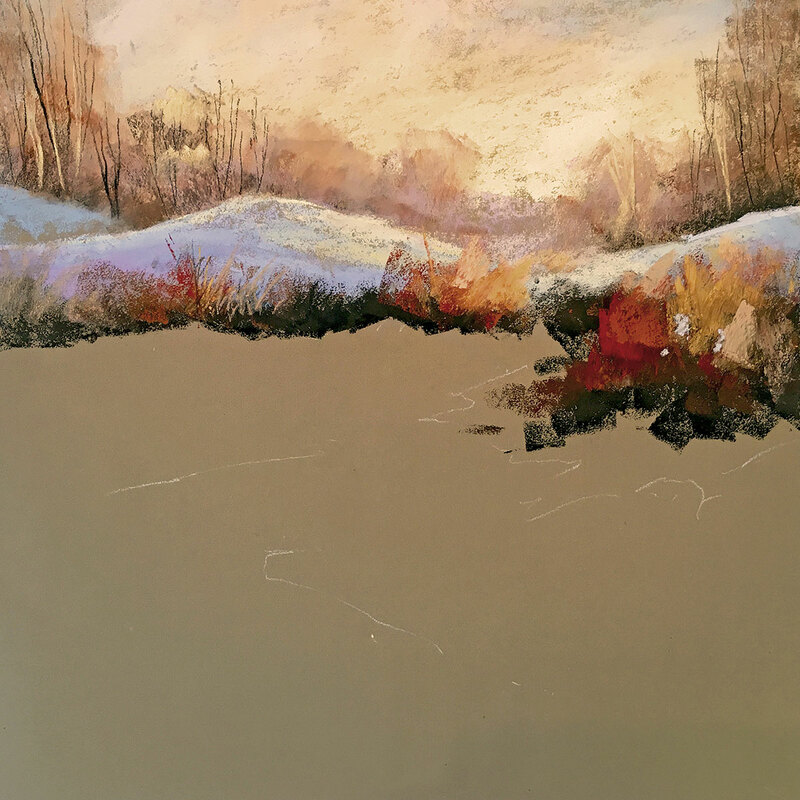 He shows how he builds up a pastel painting focussing on the light in a snowy landscape and how he uses the colour of the paper surface as part of the painting. I begin by just positioning my elements with a white pastel pencil, then apply a few colours for the sky using a gentle, light touch, I use some Light Blue and Violet. I then start to us my warmer colours leading up to the lightest soft yellow in the focal point, just at the back of the dark trees. This creates a three-dimensional sky. 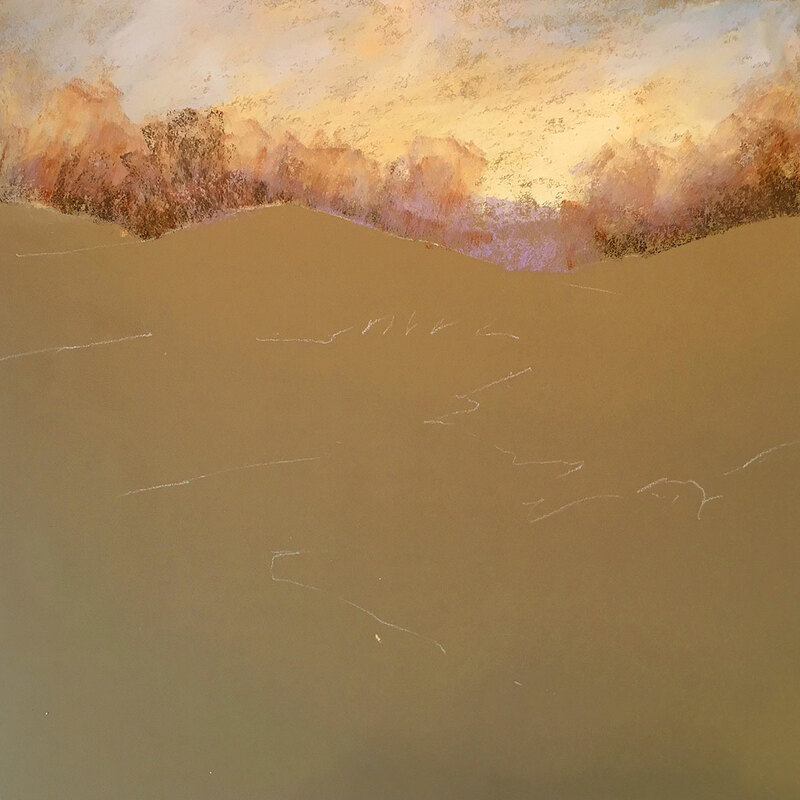 My technique for pastel is not to overfill the tooth of the paper, but to work with it allowing some of the textured surface to be a part of the painting. That is enough pastel to complete a blend. I blend those colours of the sky with my fingers but only for a few seconds to create a lovely glow in the sky. Over-blending destroys colour and this painting is very much about colour and light. I want to create a few winter trees on the horizon line to create depth of field in my composition. I do this by reducing the value of the trees and making them less defined. If the value of the trees in the distance is around 30 – 40% then my dark trees will still have impact when I draw them. I use some of the dark brown, the blues, purple and then some warm colours. This unifies the scene as the light in the sky will have a lot of influence on the rest of the scene. I find it is better to work dark to light with pastels using the side of the pastel to make broad blocking in marks. As an Impressionist, I find this helps to eliminate the need for over detail. I don’t really blend this at all with my fingers, but with the pastel stick itself. As I am painting with the pastel, the colours are mixing on the paper and with this wonderful textured surface, it’s perfect. With a black pastel I just add a few very light suggestions of branch work on my distant trees. These marks should be very light and varied. Just so we know they are winter trees. I love the element of suggestion, it gives the brain something to think about. 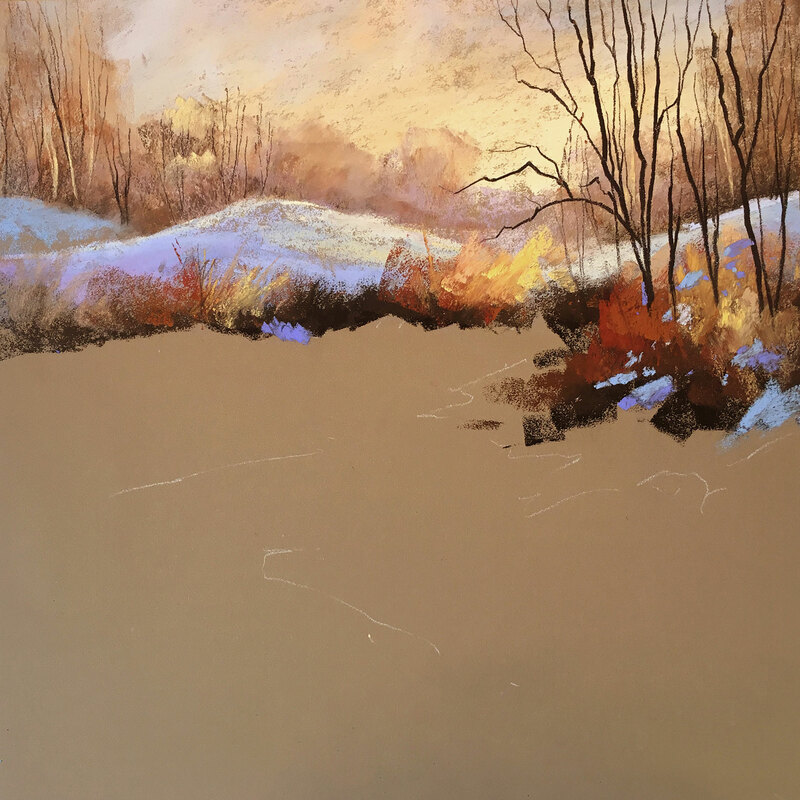 I begin to colour the snow of the small hill with a little blue and violet before adding the highlights on the top edge to separate this from the trees. Pastel is always good for making hard and soft edges, so make sure you join this area to the tree line a little bit here and there. Use the texture of the paper surface and let some of that warm sand colour come through. My paintings are always based on good composition principles and how best to control the viewers eye and never to copy a photograph. Copying photographs seems to lack that ‘Something Special’ aspect, that special light, the energy or movement in a painting. I personally think as an artist we must make that happen in our paintings. So, I block in again using the side of the pastels, those dark browns first then moving through my mid browns and finally to the lighter colours. By this time, I can use the edge of the pastel to suggest that maybe they are grasses. Notice the position of the darks and lights. A known fact is that your eye is automatically drawn to extreme contrasts. So, I very often place my extreme contrasts in the focal point and indirectly create angles with my mark making that draws the viewer into the painting. The Schmincke Soft Pastels are of a beautiful consistency for a scene such as this. Be careful not to overfill the tooth too quickly and you will have much more control over the painting. 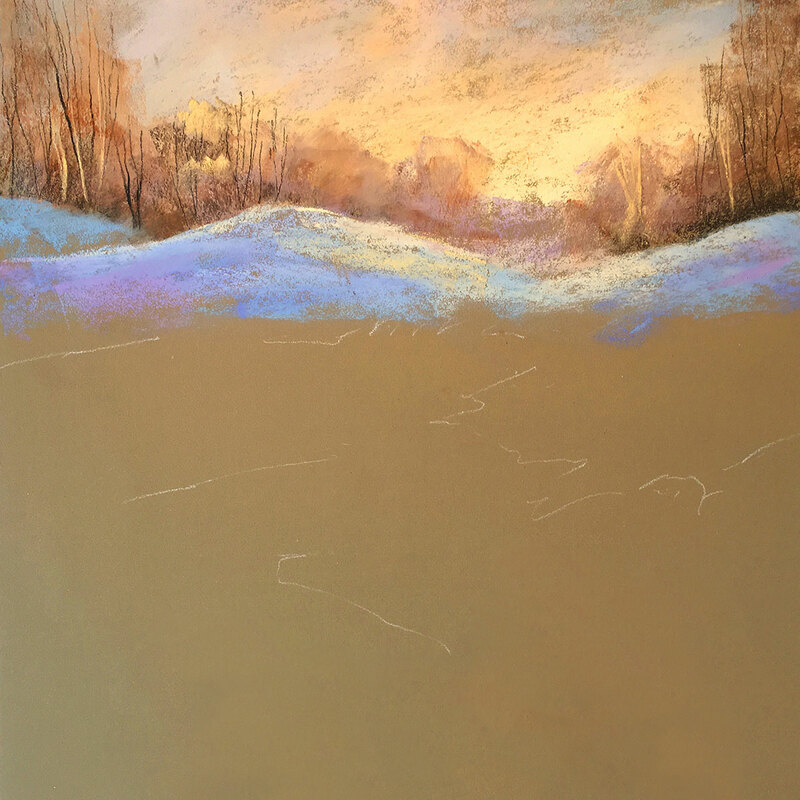 Manipulating the softer pastels takes a lot of skill and control. Over-blending when too much pastel has been added will generally create muddy effects. For the grasses to the right, I used again the Dark Brown and some Blacks to add that value as once I have added value, I can go over with my other colours to prevent the harshness of Black. I add a few little dots of snow in between the dark grasses, just to break up the solid mass of dark colours. I then use my black hard Conte stick; you can use pastel pencils or a Schmincke black pastel if you wish, although I like to get a sharp hard edge for these trees. These trees need to be 100% value meaning black, or black mixed with brown. The extreme contrast of these dark tress against the beautiful light in the sky behind them is the focal point. Notice how I make the darkest and thickest one right in the upper right third, in the focal point and use the thin branches to slightly lay horizontal. These are all compositional elements to make a successful painting. Next I paint the beautiful snow. Schmincke Pastels are soft and creamy and perfect for this. I begin my snow with the darkest blues moving up to the lighter blues, violet purples and then the soft warm lights. But first the darker blue marks, the direction of which is important. Mark making in pastel is very important and these blue initial marks begin the formation of the landscape. If painting a vertical surface, I would use vertical and horizontal marks which would help to illustrate the structure better. Since I’m painting a small, gentle gradient of a hillside I would use 20% angled mark making to illustrate this. So, the blue marks I begin with draw the viewer from the lower left corner up towards the upper right third. Angles create energy and movement. I use all the blues, violet purples and then the soft warm light colours, working from dark to light again. One of the most important things I do here is to create movement with the angles I make with the pastel. Notice that the texture of the paper still remains and is clearly visible. 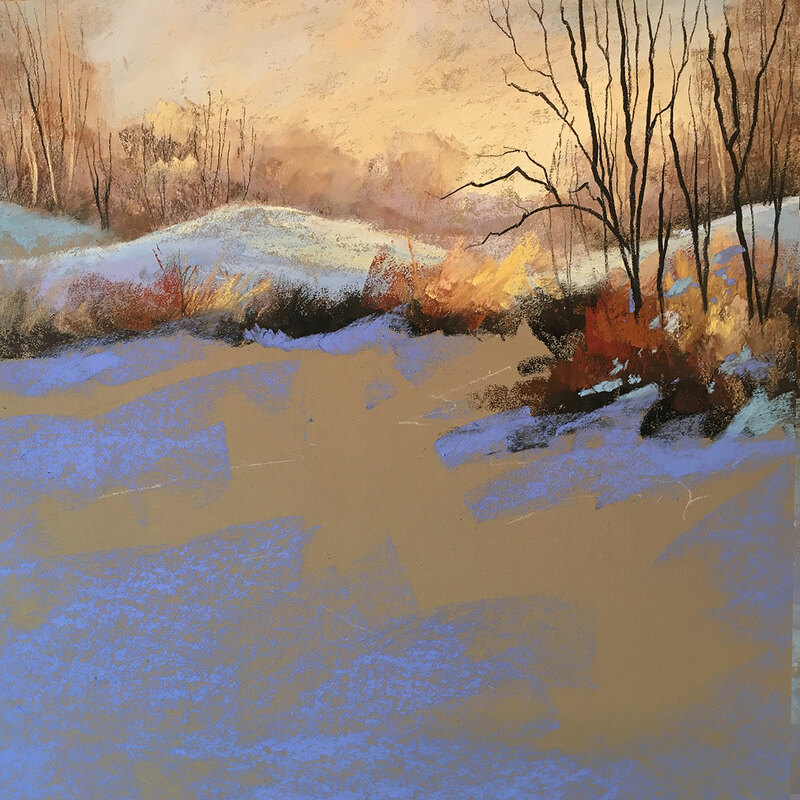 I think the sandstone-like finish of this Canson Mi-Tientes Touch pastel paper works beautifully with the wonderfully soft and creamy Schmincke pastels. 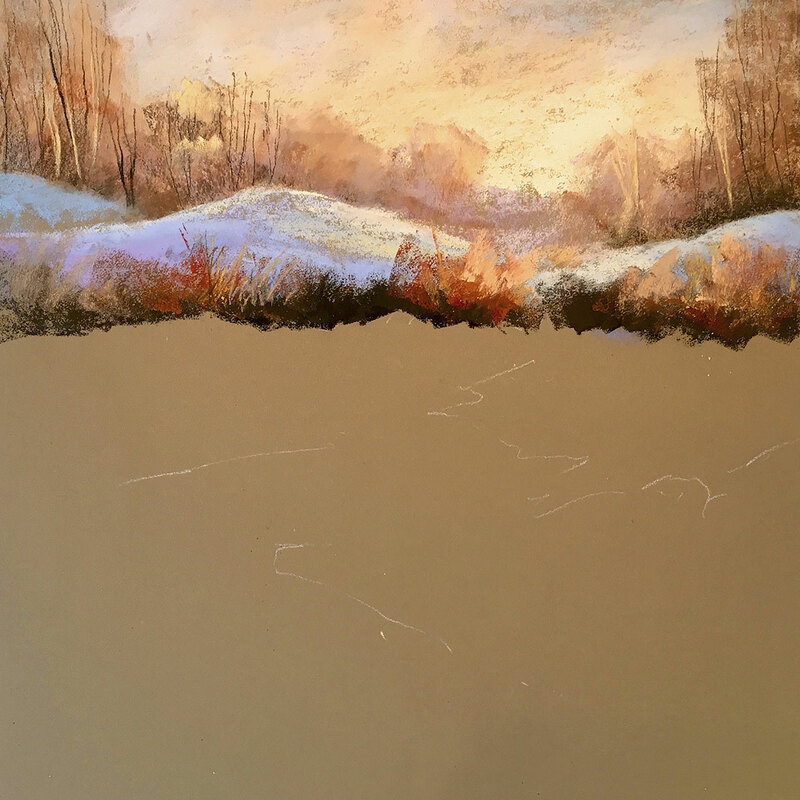 Less is always more for me, whatever pastels I am using I try to keep the texture of the landscape or seascape. By simple dragging the side of the pastel over another colour, one manages to create a luminosity which is quite special to pastels. The final stage is always where I give attention to the details, maybe some light grasses popping out of the snow here and there. These I can use for composition, too, to help with the balance and arrangement of colour harmony. It is always worth stepping back a little from your work at this final stage and you will see where you need to add that little bit of magic light. 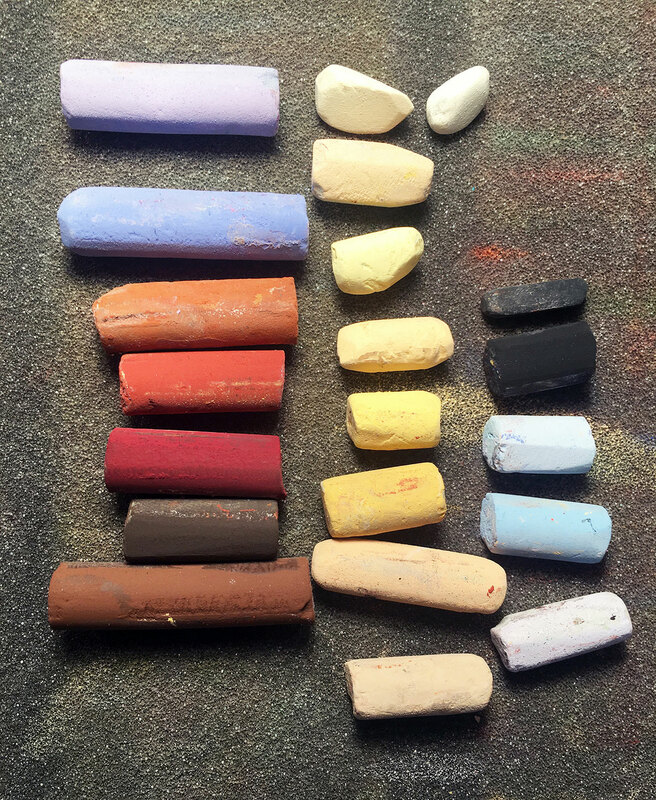 I have to admit the Schmincke white is one of the whitest pastels I have come across and I couldn’t be without one in my studio. It is soft and creamy and will go over all other pastels. Although I haven’t used white in this scene, you can always use the white to add extreme contrast. One of the reasons I haven’t used it in this scene is because of the light in the sky, which will co- lour the snow. It is good to give a final fixative treatment to a pastel painting to protect it. 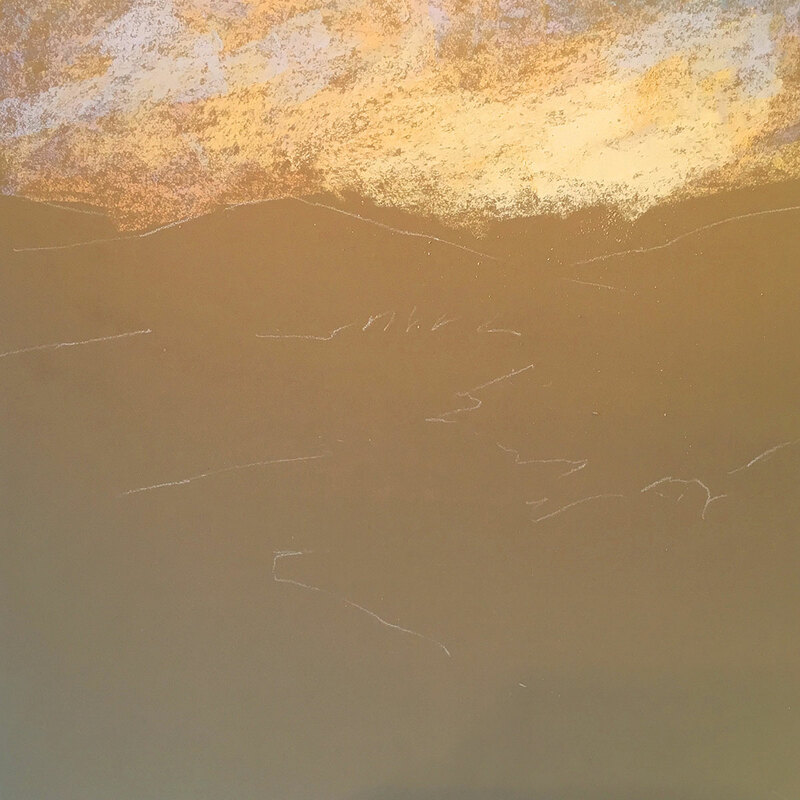 In a pastel painting the pigment layers are directly on the painting surface with almost no binder. They do not form a firm bond with the support. Without fixing, the pigments can therefore gradually trickle from the surface or smear off. Pastel paintings should therefore be fixed with a spray fixative. We recommend a high-quality spray fixative based on alcohol with a particularly high fixing effect, non-yellowing, resistant to aging and quick-drying. Les Darlow was born in Blackpool, Lancashire in 1961 and trained as a technical and Scientific Illustrator. He says that he has “freed myself of the technical preciseness of a photo realistic painting I now paint expressively and creatively, producing paintings that are based on feeling, light, energy and movement.” He has a love and passion for weather and landscapes and most of his paintings are of subjects that have that connection for him. He thinks that one can paint the same scene over and over again because light and weather change the subject continuously. Schmincke Soft Pastels are available as single sticks and in carefully selected sets, including beautifully presented wooden box sets.